Costa Rica is between Nicaragua and Panama in Central America. San Jose is the capital as well as the largest city in Costa Rica. Her people are warm, friendly and extremely welcoming. After spending months in Granada, Nicaragua, it was a very nice sojourn to come to San Jose and enjoy the cooler temperatures that her elevation offers. Honest, I needed a blanket at night. I had real goose bumps, the first I had seen in many months of traveling throughout Central America. Nice surprise to know they are still alive and well. San Jose is an amazing city to walk around. There is so much to discover here, universities, museums, arts and entertainment. The old sits alongside the new and both seem to dance in a harmony of life that is truly impressive. 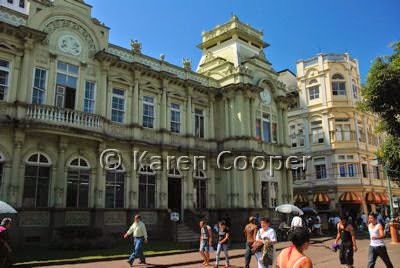 I sat in a coffee house enjoying some very good Costa Rican brew, in a old building that housed the now new post office. It blended together perfectly, like the milk in a latte. I will return often, not only to have a reunion with my almost forgotten goose bumps. But to enjoy this exciting city of culture and history. A true balm for the senses. I see, you are moving slowly back "North"...LOL.. Costa Rica must be really nice, I heard, and a lot of Americans and also Swiss people (!) are settled down there, because of the beauty of the country. Have a good stay and stay warm..LOL..
Costa Rica looks like a good place to stay. Anyway, thanks for visiting my blog.